How will these digital tools, processes and data sources converge and compliment in the future? How will people, policies, projects and technology come together to better plan, design, construct and operate a more sustainable world in the future? This presentation will look at the emerging business of Digital Cities and examine the industry as it moves to better capitalize on this exciting time of convergence and opportunity. One of the critical geo-enabling technologies that has been embraced and supported by the open source geospatial community is the FDO API, which exposes a full Web 2.0 geospatial data creation and edit API to web clients and supports a wide range of file-based and RDBMS data sources. An introduction to developing Web 2.0 applications for creating and editing geospatial data based on a RESTful implementation of the FDO API will be presented. This paper explores the interaction of parallel, but inter-related trends in the geospatial landscape. We examine the relationship between the evolution of Open Source and Open Standards and their impact on how the SDI is viewed. The requirements and the opportunity for SDI to evolve are explored. In this same context, the growing importance of 3D and 4D (time) data is considered, as is the need for increasingly robust visualization engines consuming complex data to support sophisticated scenario or what-if modeling in the context of planning and life-cycle management applications, etc. Local governments are small enough that traditional geo SDI is generally adequate for internal functions. However, with increasing demands for transparency in government information, and the need for immediate and current data during emergency response, the ability to publish geographic data in formats like KML and GeoRSS is going to be critical to the mandate of local government. This talk will cover and demonstrate how easily local governments can repurpose their existing infrastructure to take advantage of these exciting new opportunities. New uses have been found for LandXML data in aviation and construction machine control. In 2007 LandXML was selected by the US Federal Aviation Authority as the digital survey data submission standard for the FAA Airport Surveying - GIS Program. The program uses automated data validation and quality testing to find errors early in the process. A data exchange standard bridging design and construction is needed by AASHTO for the contruction phase for roads. LandXML provides 3D data models used by GPS enabled, robotically controlled grading machines. Mapguide Open Source brings together CAD, GIS and BIM Technologies, Neal Niemiec, Geospatial Technical Specialist, Autodesk, Inc. This workshop will look at integrating CAD, GIS and BIM technologies within a web-based mapping environment. Attendees will learn how to build basic web 1.0 web-based mapping applications using Mapguide Open Source and FDO technologies. This will be combined with an overview of BIM and building an application that will integrate CAD, GIS and BIM models like IFC, CityGML, DWF and KML. Moderator: Michael Gerlek, Software Architect, LizardTech, Inc.
Free and Open Source software continues to be a key part of today’s GIS infrastructures, and servers are perhaps the most prominent part of such an open spatial data infrastructure. This presentation will introduce GeoServer, one of the major open source servers available today. The presentation will cover the server’s particular strengths, its support for OGC interfaces and other interop/compatibility features, the depth and strength of its user base and developer base, and more. Federal Governments in the US and Canada are developing data models for the exchange of data about critical infrastructure for emergency planning, security, and first response. Outside of government, organizations such as LandXML.org, Open Geospatial Consortium, International Alliance for Interoperability (IAI), Multispeak.org, and IEC have adopted domain specific open standards for data exchange such as LandXML, GML, IFC, Multispeak, and CIM, that are widely implemented by local governments, industry, and utilities. In this panel discussion experts from standards organizations, government, and industry will discuss the proposed government data models, how they related to open standards, and their implications for local government. This presentation will discuss a new and innovative approach to combining the power of location with existing social networking platforms such as Facebook. Applications in this area have largely focused on a person’s current location, but this presentation looks at how knowing a person’s future location can open up new possibilities and potentially gain a much greater critical mass of users. Advents in the application of geospatial technologies for emergency response put a plethora of information at the fingertips of those departments than can afford them. Yet a digital/analogue divide is present and growing between such entities and those without the funding or technical support needed. This presentation will provide an overview of the steps needed to close this gap and help bring emergency responders forward as community using standardized and interoperable products. For francophones Gwenael Bachelot has just published an interesting article on CAD/GIS integration CAO et SIG : l'avantage de n'avoir qu'une version de la réalité du terrain in the French edition of Directions Magazine. If you enjoy this, Gwenael also has his own blog Geospatial made in France , that you would enjoy as well. For all of you who are interested in running AutoCAD Map3D on Citrix, there will be a live webinar June 25, 2008 10:00am PT / 1:00pm ET. This webinar is specifically targeted on utility and telecommunication organizations. The background for the webinar is that Citrix and Autodesk have recently partnered to provide secure on-demand access to AutoCAD Map 3D through Citrix XenApp™ which provides a way to significantly reduce IT hardware costs when deploying AutoCAD Map3D to a large number if users. One of the things that has struck me after a number of years travelling and visiting utilities and telecoms world wide is the similarity of the process used to design and manage utility and telecommunications networks, not only across different geographies but across different sectors, power, water, waste water, gas, cable, and telecom. The basic process for designing and managing a network is essentially the same the world over. Designers or planners create the initial design, called a construction drawing, for the facilities to be constructed. Designers need to worry about three things; physical things like attenuation or voltage drop, sag between poles for aerial facilities, pulling tension for underground facilities, gravity and flow direction for waste water; financial things like bill of materials and job estimates; and adhering to the engineering design standards of the organization. These are important because they not only ensure that facilities are depicted in a way that everyone understands, but also that the data model which defines types of equipment like transformers, conductors, and fuses, properties of each type of equipment like voltage, year installed, and manufacturer, and relationships between different types of equipment, such as connectivity is enforced. Enforcing the data model is critical because it enables functionality like finding customers affected by a failed transformer or a controlling device that has left customers without power. In many organizations engineering design standards are enforced by either an in-house developed custom application or, as is often the case if the design work is outsourced to contractors, by an in-house developed custom QC (quality control) application that is used to verify that drawings submitted by contractors meet the organization's standards. Construction crews, often comprised of sub-contractors, build the facilities using paper construction drawing. During construction, the drawing may be marked up or redlined to reflect changes in the original design. After construction is completed, the construction drawing, now referred to as an "as-built", is forwarded to the records department. The records department enters the as-built into the permanent records database, which is maintained as the company's record of its network infrastructure. The records database is used for a variety of activities such as reports about the network requested by the regulator or my management. For work relating to connecting or disconnecting customers to the network, adding new services, repairing or replacing network facilities, the records department is responsible for preparing facilities maps to assist field staff. Operations field staff are responsible for fulfilling work orders responding to customer requests, outage events, and maintenance. Work orders typically involve installation of new facilities or repair of existing facilities. Field staff use facilities maps in finding and identifying network facilities such as transformers and fuses in a power grid, valves in a gas or water network, amplifiers and nodes in a cable network, or pedestals and cross-connects in a communications network. Ideally the facilities maps are returned to records with markups that show corrections and changes to facilities data reported by field staff. Utilities and telecommunications companies are facing the same global challenges that other sectors such as construction are, global climate change which is forcing utilities to reduce carbon emissions, aging infrastructure, and an aging and shrinking workforce which is motivating efforts to improve productivity. One way of improving the productivity is to improve the flow of engineering design information through engineering design, construction, and operations lifecycle and to achieve this utilities and telecommunications companies are focusing on seven areas where they see that often significant improvements in productivity can be made. Design productivity has become critical as a result of the aging and shrinking workforce which means that organizations need to do more with less. Organizations are losing experienced designers to retirement faster than they can replace them with younger inexperienced workers. This means that they are not only facing reduced headcount, but also fewer experienced workers. Organizations are looking to improve productivity by speeding up the design process by 1) integrating engineering calculations such as attenuation, voltage drop, guying, and pulling tension and 2) automating bill of materials and job estimation, and 3) ensuring that networks are built to engineering standards to avoid costly failures. In addition organizations are looking to reduce costs by optimizing the network by avoiding over-engineering by ensuring that equipment is sized appropriately for the requirements. IT departments in utilities and telecoms have realized that maintaining in-house developed custom code is expensive and are looking for COTS (commercial off the shelf) applications to replace their in-house developed code. The field staff are often frustrated by the poor quality of the facilities maps they receive with their work orders. They are also frustrated by business processes that more often than not discourage field workers from providing valuable information back to records about inaccuracies they observe in the field or about changes they have made. Organizations are looking to implement mobile solutions that enable field workers to not only have immediate access to the records database, but increasingly enable field workers to provide valuable updates from the field to records. Field workers are familiar with facilities because work with them daily, and they need accurate data about facilities to be productive. By enabling field workers to participate in maintaining records data, data quality can be improved which enables field workers to be more productive. One of the major challenges in utilities and telecoms face is the “as-built” problem. A symptom of this problem that can be found in utilities and telecoms is an as-built backlog, comprised of as-builts returned from construction that are waiting to be entered into the records database. These backlogs, which can stretch from several months to years, mean that the records database is always out-of-date making it difficult to provide reliable information about network facilities to the field, management, and the regulator. Another problem associated with the as-built problem is data redundancy. 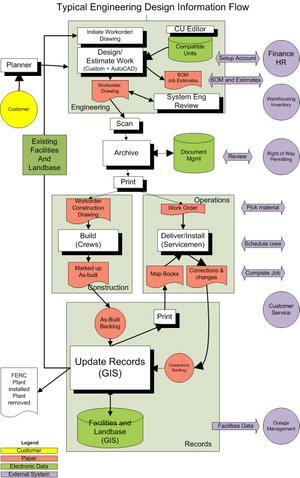 In many organizations the as-built problem is the direct result of paper flow, paper as-builts coming back from construction are redigitized into the records database, often a traditional GIS. Organizations are looking to find ways of eliminating as-built backlogs and the data redundancy resulting from a paper-based information flow. Poor data quality has serious implications for the organization such as unreliable reports prepared for management and for regulators, which can lead to massive fines such as though seen in the water industry in the UK, negative impacts on the productivity of field staff with the concomitant impact on the bottom line, lengthening the time required to respond to outages, and inhibiting the rapid deployment of new services because the design data critical for servicability calculations used to customer access to services such as broadband, cable, or power is either not available or unreliable. Estimates of the quality of records databases in many utilities and telecoms in North America are on the order of 70% or poorer. Some telecos, for example, have found that the quality of their databases are so poor that they have sent crews to the field to recapture the facilities data that is critical for determining broadband serviceability. One of the things that leap out of diagrams of the flow of engineering design data in utilities and telecoms like the one I have included is the problem of islands of technology (CAD, GIS, ...) connected by paper-based information flows. If you look at the diagram of the flow of engineering data in a utilities or telco that I have included, you can see a lot of paper flows, represented in the diagram by red. 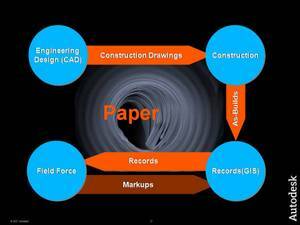 For example, in many organizations the as-built problem is the direct result of paper flow, paper as-builts coming back from construction are redigitized into the records database. Organizations in all sectors are looking to reduce the flow of paper, not only as part of a green initiative to save trees, but also because paper flows result in data and process redundancy, inhibit productivity, and impair the agility of the organization. Organizations have looked at what has happened in the banking industry, airline industry, and web-based retail, and can see the benefits of reducing paper-based information flows.